Pablo Picasso was born on October 25, 1881, in Malaga, Spain. As a boy he was an artistic prodigy: at 14 years old he completed the one-month qualifying examination of the Academy of Fine Arts in Barcelona in one single day. Later he studied at the Academy of San Fernando, Madrid, returning to Barcelona in 1900, where he frequented the city's famous cabaret of intellectuals and artists, Els Quatre Gats. Pablo Picasso, the inventor of Cubism, along with Georges Braque, was probably the most famous artist of the twentieth century. His artistic career lasted almost 75 years. An extremely prolific artist, in his lifetime he created literally thousands of works in many different mediums. Picasso changed the face of Modern art, more profoundly than any other artist of his time. 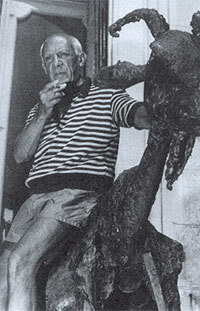 Pablo Picasso died on April 8, 1973 in Mougins, France at the age of 91.